In-demand skills come and go, but this one will stay for life. The only constant is change. Your degree will only carry you so far. Your current skill in a certain field will only be relevant for so long. After all, many jobs that exist now were unheard of a decade ago. The only way to survive and get ahead in this ever-changing world is to sharpen the skill of learning. It’s no coincidence that the Learning How to Learn class from Coursera is the world’s most popular online course, with students from over 200 countries learning the mental framework to overcome any difficult topic. Personally, it’s also no coincidence that I was able to consistently pick up new skills and accelerate my career through monthly learning challenges. If it’s essential to be a lifelong learner, then it makes sense to invest time in strengthening this meta-skill. As Abraham Lincoln once said: “Give me six hours to chop down a tree and I will spend the first four sharpening the ax.” The more you understand how to study effectively, the better you’ll be able to apply these concepts, the more equipped you’ll be to acquire skills. Win-win-win. 1. Make a connection between the new and old. Our brains are made of neurons which transmit information between each other across synapses. When you learn something new, your brain literally makes a connection between the neurons. The more synapses made, the more interconnected your knowledge and deepen your understanding becomes. Thus, it’s helpful to generate metaphors or link an abstract concept to something concrete that you already know. For example, making the analogy that your mind is like a library. Within a library, there are existing categories like History or Psychology to file books away under. Similarly, with new incoming information, your mind also files those away according to current labels. Thus, it’s much easier to understand something if a) you have already had an existing category for it, and b) you have examples within the category to help you integrate the information. Chunking is the act of grouping concepts into compact packages of information that are easier for the mind to access. Because short-term memory can only hold about four things at any given time, if you group the different pieces of information together into one larger whole, you can use just one of the four available slots. For example, if you’ve ever needed to memorize colors of the rainbow, chances are that you used the acronym “ROY G BIV”, or if you played music, you used “Every Good Boy Does Fine,” to read treble notes. When you make a connection with something you already know, you learn and remember it better. The best way to learn something is through experience because it bridges the gap between knowledge and skills. There’s a difference between passive and active learning. Just because you highlight or underline something, doesn’t mean that you’ve learned it — and personally, the worst way to learn that is during an exam (I’m speaking from experience☺). Also applicable to the working world, if you watched video tutorials or read guides, it only means that you are aware of the instructions on how to do it, and not necessarily the ability to carry it out. Pure regurgitation or recognition is easy but recalling it or teaching it to someone is not. If you’ve ever gotten into a situation where everything went well during studying, but when the crucial time came you realized that you didn’t actually know the material, this my friend, is the illusion of competence. The roadblocks and obstacles we run into when we’re learning something new is what helps us store it in long-term memory. This is why companies emphasize working experience, and why side projects are helpful if you’re trying to really learn something well. The trick is to just start. Sometimes all those open tabs to do more research are just forms of procrastination. Your brain likes pleasant things, so when it encounters something that it thinks will be difficult, it tries to switch your attention to easier things, like watching Netflix. However, researchers have discovered that not long after people actually start working on a task, the perceived discomfort soon disappeared. It’s like when you get to the gym, you realize it’s not too bad after all, and when you’re all sweaty after your workout, it feels great and you’re happy that you went. The more you practice something, the better you’ll get, and the more enjoyable it becomes. And then you’re off to the races towards mastery! To make sure you constantly progress, you can use deliberate practice, in which you intentionally focus on weak parts of your performance and use measurement and feedback to systematically improve. It’s only through experience that you can improve and learn what to improve. 3. Rest to get stronger. Learning is like a mental workout for your brain. Just like a muscle, the more you exercise it, the stronger it gets. And just like a physical workout, when you give it time to rest and recuperate, you get stronger. When you sleep, the brain actually uses that time to clear out harmful toxins from the day, updates the cells, and integrates new information. So when you only get a couple of hours of sleep, it’s similar to only 50% of the new files getting downloaded into your brain storage system. Additionally, studies have shown that it’s actually best to sleep right after you learn something new so that the information is super fresh for the brain to consolidate into memory. When we’re resting, we enter the diffused thinking mode, in which your brain relaxes and your thoughts are free to wander. This is also the mode that allows your thinking to get stronger, specifically your creative thinking. When you take a break from focused mode, it creates space and freedom for your subconscious to marinate on it. This is why people often make unexpected connections and breakthroughs in the shower or while taking a walk. Another reason why it’s important to take breaks between learning is that according to the spacing effect, learning is more effective when studying is spread out over time, rather than all in one session. Basically what I’m trying to say is that there’s scientific evidence that cramming is ineffective. While it was passable to cram for exams and forget everything the day after, the real world doesn’t test on word-for-word answers, but rather application and skill. Thus, you actually want to learn and incorporate the information into your knowledge toolkit rather than restudying it every time. Enter spaced repetition. 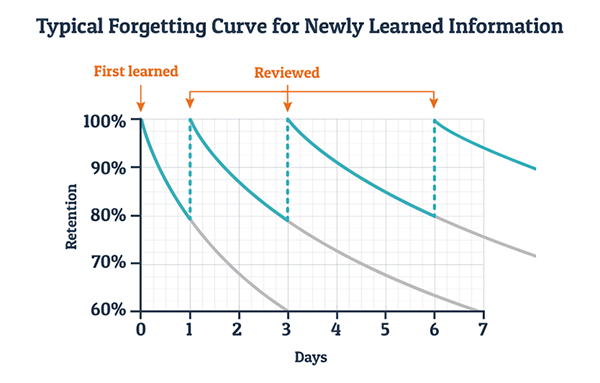 Because we operate on a learning forgetting curve, in which we forget about 50% of what we learned within an hour of learning it (thanks for the tip Ebbinghaus), research has shown that spaced repetition, or repeating things after a couple of days, is the best way to reinforce learning. The language flashcard app Anki does a great job of using an algorithm to bring up words on days that you’re most likely to forget them so that your memory is constantly refreshed. Experiential projects also help keep new concepts on top of mind, by you directly working with what you’re trying to learn. Thus, make sure to let your brain rest between learning sessions to become more creative and effective at learning. Learning is hard. But we can make it easier by tying new information to something we already know, getting hands-on experience and making the best use of resting periods to turn fleeting concepts to long-term skillsets. When we learn to learn more effectively, it opens up countless doors and a world of possibilities. If we don’t know something, we can find out about it. If we don’t have a skill, we can acquire it. Which one of the tips from above will you start incorporating to get better at learning? 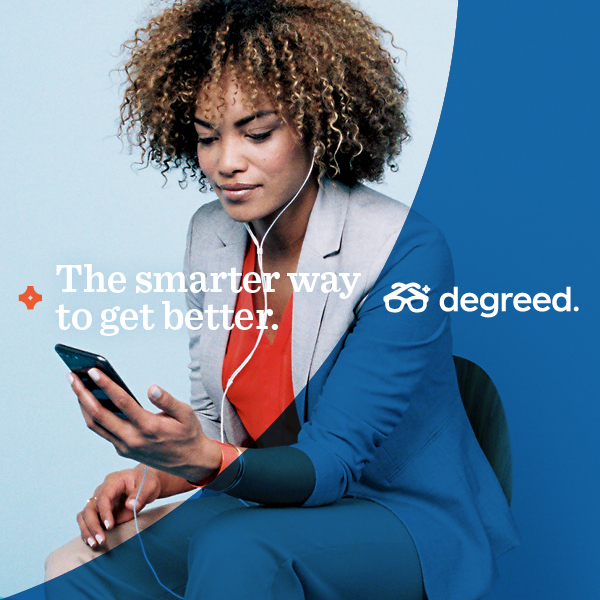 Tell us in the comments and start learning at Degreed. This post was authored by a Degreed power user, Yunzhe Zhou, who founded One Month Projects to coach driven professionals in acquiring a meaningful skill in 30 days. We thank Yunzhe for her insights!